Till recently I used to place images used on my blog at my own website. I would do this as I was using the free WordPress.com site where storage was limited. Well, I found out that if I update the image on my personal website, WordPress will take an unknown time to update it at the blog. Till recently I used to place images within my WordPress blog at my own website. I would do this as I was using the free WordPress.com site where storage is limited. Well, I found out that if I update the image on my personal website, WordPress will take an unknown time to update it at the blog. 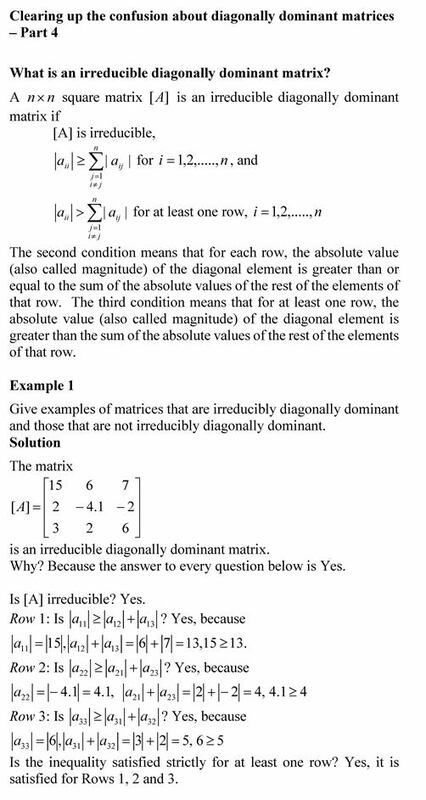 I use img src=”nm.mathforcollege.com/blog/irreducible_diagonally_dominant1_Page_1.jpg” to include the image in my blog. WordPress source puts the image on a secure server as https://i0.wp.com/nm.mathforcollege.com/blog/irreducible_diagonally_dominant1_Page_1.jpg (concentrate on the paragraph before Example 1 to note the difference) . As of this date, October 21, 2016, 2:50PM EDT, the two images are different (the image is updated now as of October 30, 2016). It is because I updated the image on my website but it did not get updated on the wordpress.com site. I have cleared my cache, used different computers and browsers in the house that do not belong to me, used my desktop computer at school, but the result is the same – the two images are still different after a week of updating. WordPress support has been helpful and ultimately says that it is an image cacheing problem and there is no set time for it to be cleared. I have resolved the problem by avoiding it. I now upload images to the WordPress site as I started using the paid premium site.